Recently I wanted a copy of my carefully picked QuiteRSS feeds on a CentOS 7 system. I first copied the backup from my Linux Mint 17.2 to an USB drive and then copied the files to the desktop of my CentOS system. Unfortunately, there’s no option to recover from a backup from inside the QuiteRSS program. This is a weakness of the application. Offering a way to create the backup from within the program’s menu but not to provide a way to restore the backup from inside the program menu seems odd. But it didn’t take long for me to find a solution to restoring the backup. When you make a backup, the program creates two files. Depending on the date of your backup, they’ll look like this – QuiteRss.ini_2015-08-03_07-57-56.bak and feeds.db_2015-08-03_07-57-56.bak. Rename the two files created from the backup to QuiteRss.ini and feeds.db. Close QuiteRSS before restoring the backup. Hit y key and then the return key when it asks you for permission to overwrite the file. Now it’s time to copy the feeds.db file. Again, hit y key and then the return key when it asks you for permission to overwrite the feeds.db file. Open QuiteRSS and you should see that the backup has been restored along with your customizations like “star” feeds etc. In my example, I copied the backup from a Linux Mint 17 system to a CentOS 7 system and it worked fine. 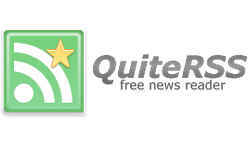 If you’re a fan of RSS readers, I suggest you give the solid QuiteRSS a try. If you’re running Fedora, it’s on the EPEL repository making it an easy download and install. If you’re running CentOS, just enable the EPEL repository and you should be able to easily download QuiteRSS to your computer. VirtualBox Matures into 5.0 with Improved Security How Many Webs are There?